Alice C. Richer, RD, MBA, LD, is a registered and licensed dietitian, advanced certified functional nutritionist, and certified medical writer who has been helping patients to improve their nutrition and wellness for more than 25 years. Richer, Alice. Food Allergies and Sensitivities: Your Questions Answered. Greenwood, 2019. ABC-CLIO, publisher.abc-clio.com/9781440856358. 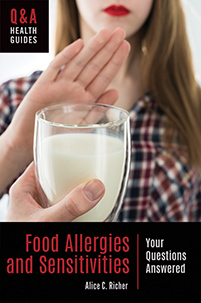 This book provides an easy-to-understand introduction to the topic of food allergies, sensitivities, and intolerances—unique but related conditions that affect many children and adults. The information, guidance, and resources it offers make it a valuable tool for anyone who struggles with negative reactions after eating certain foods.